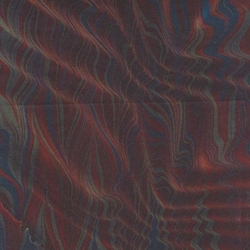 Exquisite, hand marbled papers made in the US by artist Stephen Pittelkow. Each and every sheet is an amazing work of art unto itself. Beautiful color combinations and classic marbling techniques come together in Steve's papers. The paper itself is 120gsm, mould made of 100% high alpha cellulose, and is pH neutral. Perfect sheets for book making, collage, book covers, card making, origami, and all paper arts. Sheets measure 18x24 inches and no two are alike. This sheet is done using a black piece of paper, giving a different effect from Steve's other designs.